Cap'n Howdy's Blogorium: Cap'n Howdy's (Back)Log: Documentary Recap! Cap'n Howdy's (Back)Log: Documentary Recap! While it may come as a surprise to readers that the Cap'n spends time watching more than just schlock, more often than you'd expect I'll sit down and watch a documentary. What you may notice is that I don't often write about them, usually because I don't feel like rehashing what they're about. Ultimately, the question is whether there's something new to learn about the subject that you didn't already know (if you knew anything about it in the first place), and I suppose that most of the below succeed in that category to one degree or the other. In this instance, I'm including these mini-reviews to let you know they exist, because I hadn't seen or heard too much about them prior to screening. 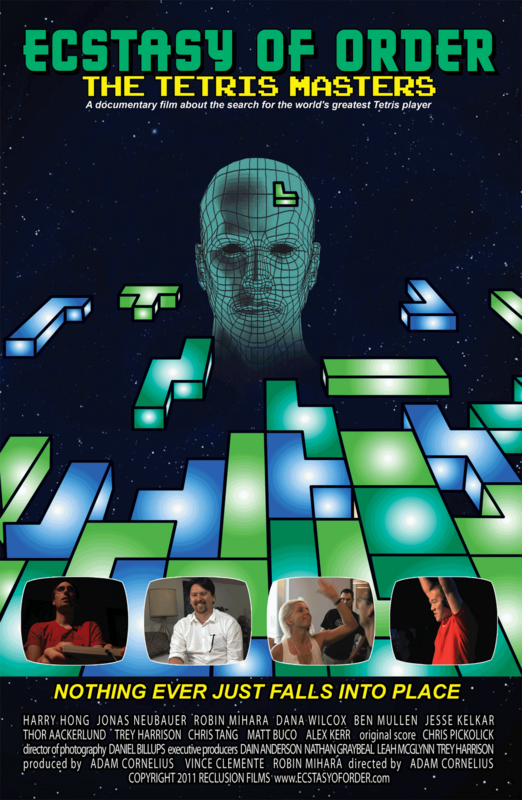 Ecstasy of Order: The Tetris Masters - It's hard not to see this movie and draw parallels to The King of Kong, because they are, in essence, about the same thing. Tetris fan Pat Cotri discovers that while there are a number of rankings on various sites, there has never been a tournament to determine a champion for the game, so he organizes one and invites various "masters" from around the world to compete. Looming over the entire event is the question of whether Thor Aackerlund, the legendary wunderkind of the Nintendo World Championships of the 1990s, will return from a self-imposed exile in order to join the tournament. Where Ecstasy of Order differs from The King of Kong is that there's no "David vs. Goliath" angle, ala the Billy Mitchell / Steve Wiebe high score battle. These are evenly matched players who accomplished extraordinary feats with the game of Tetris (the NES version, for those curious), including the rumors that Thor not only reached "Max Score" but has more lines than anyone on the "Kill Screen," - the point at which lines begin to fall so fast it's nearly impossible to line them up. Rather than deal with human conflict, Ecstasy of Order centers around technique, about the approach to Tetris, and about the many ways players accomplish feats most of us didn't know where possible. It becomes a bit hypnotic, and that's well before the demonstration of the "invisible pieces" version of Tetris appears in the film. I won't reveal who does and doesn't make it to the tournament, let alone who wins, but I appreciated the level of respect among competitors. The title of Tetris Master is no misnomer in this case. Rewind This! - A documentary about VHS tapes and the people who love them? Yes indeed, my friends. 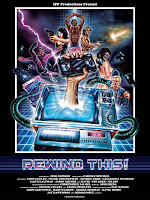 Designed as a love letter of sorts to a (mostly) defunct staple of home video, Rewind This both covers the history of the videotape, its rise and fall, and the fanatics who go out of their way to collect the obscure and the bizarre releases that will in all likelihood never be released again. As somebody who grew up during the era of home video (and who has more than a few VHS tapes at home), it's nice to see that the love for the format still exists, even though tapes have a worse chance than vinyl of enduring over time. The very things that come up about why VHS is so endearing - the tracking lines, the wear over parts of the film replayed repeatedly - are the very reason that they don't last. Tapes wear out, break, and can sadly be erased at a moment's notice. 41 - I didn't know much about George H.W. Bush - as a President or as a man - when I watched 41 so in that regard this HBO documentary was informative. It's much more focused on Bush as the man rather than as the public servant, and surprisingly doesn't cover much of his time as President (or, for more obvious reasons, his period in the CIA). If you don't know much about him or his family history, it's certainly worth checking out, but don't expect much in the way of political gossiping, ala Clinton's My Life. Other than a very curt mention of how he "doesn't want to talk about" Ross Perot and the 1992 election, Bush is remarkably magnanimous towards most of the people he worked with. You also won't learn too much about what he thinks about George W. Bush, or Jeb for that matter, but there's plenty about the dogs. I don't mean to undersell the documentary as fluff, because it really isn't - you'll learn a lot about Bush's personal history and home life, but there's a limit to the political lessons to be gleaned from the experience. Richard Pryor: Omit the Logic - Showtime produced a rather thorough documentary about the life of Richard Pryor, from his earliest stages of comedy right up until his premature retirement due to advanced MS. I must admit to being surprised at how much of Pryor's career I wasn't aware of, in particular the period before he dropped out of comedy to reinvent himself in anonymity out west. There's a great deal more to the "freebasing" incident that led to burns all over Pryor's head and body than one would think based on more cursory career retrospectives, and certainly more about how he lived after MS sidelined him (something even a heart attack couldn't do earlier in his life). I'm not sure that I'd ever seen footage from the failed attempt at Live on the Sunset Strip that preceded the concert film we all know, but it's fascinating to see his awareness that it's just not happening. My only gripe is that among all of the other comedians, celebrities, friends, and lovers interviewed, I don't understand why Dave Chappelle was included if he only appears twice in the documentary, for a total of less than two minutes. Both times he appears the comments are more conjecture than insight, and it seems like a waste of Chappelle to bring him in only to add nothing. 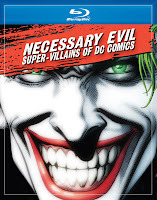 Necessary Evil: Super Villains of DC Universe - My familiarity with the villainy of the DC Universe is mostly limited to Batman, with a smattering of Superman and Green Lantern antagonists thrown in for good measure. Other than knowing the names Manta Ray, Black Adam, Reverse Flash, and Gorilla Grodd, I don't know much of anything about them. I'd like to say this documentary helped, but while a lot of DC antagonists are included, the focus sways heavily on psychoanalytical reasons for villains to exist and how each DC hero's rogues gallery is uniquely suited towards them. This is not to say that the documentary, narrated by Christopher Lee, isn't interesting, but if you're looking for more than the most cursory discussion of major villains, you might wish that this could be spun off into a series. Lex Luthor and the Joker get most of the screen time, and that's not actually that much, because at a little over 100 minutes, there's more of a focus into breaking them down into types with the occasional brief overview of characters like Man-Bat or Harley Quinn (again, Batman characters I already knew about). I'm not certain who this documentary is for, either, considering that many of the participants - including DC executives, artists, writers, voice actors, and people who on the surface have next to nothing to do with the comics (WWE Superstar CM Punk shows up once specifically to mention Heath Ledger in The Dark Knight, and nothing else!) - talk about major characters as though fans have never heard of them. Doomsday's entire first appearance is covered, up to the death of Superman and an explanation of what happens if you kill Doomsday. 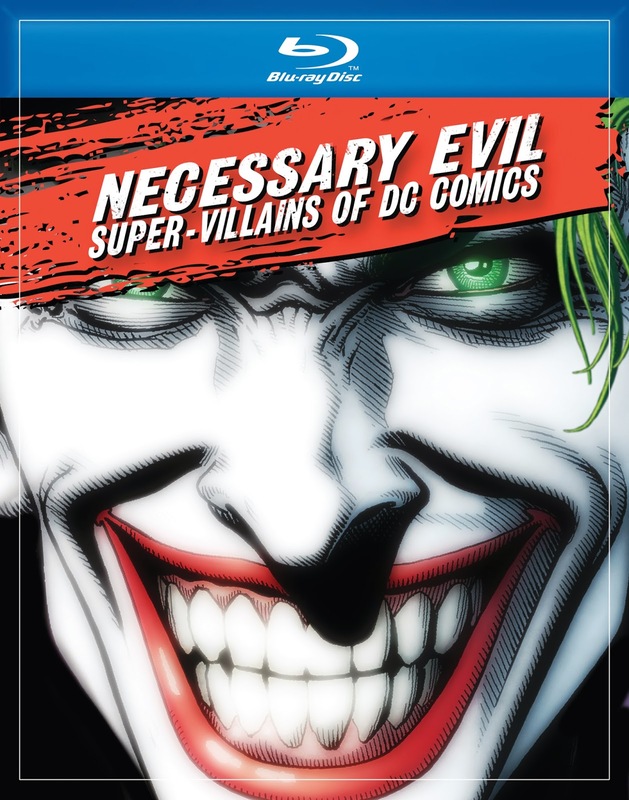 Perhaps Necessary Evil was designed as a primer for readers of DC's new-ish "52" re-launch. I'm not sure. It's fun to watch, but I must admit that it amounts to little substance by the time it ends. 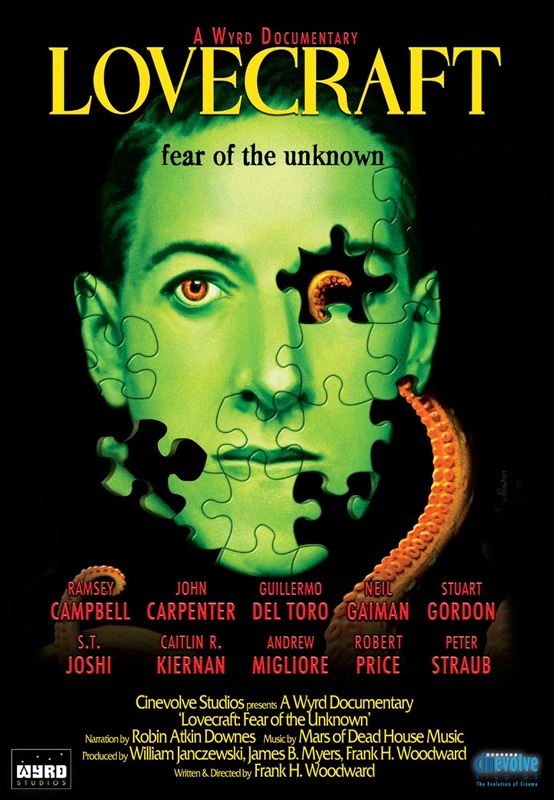 Lovecraft: Fear of the Unknown - There's a lot of substance at hand in this documentary about one of the titans of horror writing. Yes, Stephen King sells more and Clive Barker is more disturbing, but the influence of H.P. Lovecraft permeates every crack and crevice, every darkened hallway of horror to this day. What I wasn't expecting from Fear of the Unknown, what turned out to be the most welcome, was how in depth the coverage of Lovecraft's personal life and how they influenced his writing. The documentary moves in a basically chronological fashion through his life, but takes detours to analyze major stories in depth with a who's who of writers, directors, and historians. Among the interviewees are Lovecraft biographer S.T. Joshi, writers Neil Gaiman, Ramsey Campbell, Caitlin R. Kiernan, Peter Straub, and directors John Carpenter, Stuart Gordon, and Guillermo del Toro, all of whom bring a wealth of knowledge about the author and his stories. Carpenter tells the story of how, as a child, he read The Rats in the Walls in a horror anthology and its lasting effect on him. Much to my surprise, the racist tendencies in Lovecraft's writing isn't glossed over and discussion and contextualization of his opinions on immigration appear throughout Fear of the Unknown, often with a more frank and less apologetic tone than might be expected. The analysis of the stories is most welcome and the participants go well beyond rehashing the Elder Gods mythos in bringing insight to Lovecraft's many phases of writing. Also, make sure to watch the extra interviews if you pick up the disc to hear Carpenter discuss In the Mouth of Madness, Gordon explain why his adaptation of Shadow Over Innsmouth is called Dagon, or about del Toro's (currently) aborted attempt to adapt At the Mountains of Madness. Bronies: The Extremely Unexpected Adult Fans of My Little Pony - Well, maybe this should be called "the Extremely Unexpected Pre-teen to College-Aged Male Fans of My Little Pony," because at least at the outset, that's what Bronies seems to be about. This documentary is all over the place, and while I suppose it is enlightening, I'm not sure what audiences are supposed to take away from it, other than adults watch My Little Pony: Friendship is Magic. Bronies is a schizophrenic film, one that starts with a montage of teenage guys talking about how weird it is that they like My Little Pony ("it's for little girls") and then later the persistent argument is that it shouldn't be weird but gee, isn't it so weird you guys? It's never a Trekkies level of "freak show" documentary* but I really think that if people didn't continually mention how weird people must think it is even though it's totally not and we should get over being prejudicial about the fact that adults watch cartoons for kids, the message might just sink in for itself. Seriously, all the documentary really needed was the scene where the dad of one Brony who doesn't know how to feel about his son liking the show talking to another dad who embraces his son's fandom. It says more than a dozen talking heads repeating ad nauseum that "there's nothing 'weird' about it" and that bullies should stop picking on Bronies. Yes, we got it. Please can we not keep reminding the audience that it's not weird that people are geeky about things. Most of them - particularly ones who are inclined to watch a documentary about Bronies - are going to move past the "weird" phase quickly. That said, the increased scope does mean that while the focus is all over the map, there is more of an international vibe to the film. 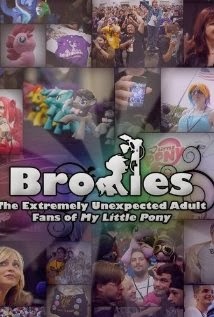 Bronies follows an Israeli DJ who makes music based on the show, a couple in Germany who make their own figurines, a young man in England with Asperger's who travels to Manchester for his first convention, and stateside, a fan from a small town in North Carolina who is incessantly bullied for proudly displaying his fandom for the show. Hearing what the show means to all of them is worthwhile, and while I don't necessarily think it's "weird" for adults or young adults (we don't really meet adult fans until well into the movie) to like a cartoon, I get that My Little Pony: Friendship is Magic is probably viewed differently than Invader Zim or SpongeBob Squarepants (shows that started airing when I was well into my twenties). Interviews with de Lancie and voice actor Tara Strong are valuable, as well as insight from creator Lauren Faust, but I think Bronies tries too hard to be too many things - a late inclusion that "oh yeah, adult women like My Little Pony: Friendship is magic, too!" seemed, well, odd, as though the focus needed to shift once more well into production. This is a side note, but I could tell it was a Kickstarter funded production when the movie ended with nine minutes to go, and sure enough, eight of those nine minutes were names of people who helped to fund Bronies. I hope they don't mind that I skimmed that part - normally I watch the entire credits of a film out of respect for the people who made it, but even the Cap'n has limits. Still, enlightening, I guess, in that I a) had no idea there was a new My Little Pony show (and I worked in a toy store!) and b) that it had unexpected adult fans. Good on you, Friendship is Magic! * In truth, nothing is ever as strange as the Trek-themed dentist, and yes, I get that initially My Little Pony cosplay just looks like neon "furries," but I've seen weirder examples of fandom. Like Steampunk. Yeah. Steampunk Comic Book Cosplay. That is a real thing.